The annual search for Mr. and Ms. ASEAN Ambassadors has been SPUP’s parade of spectacle and pageantry. This year’s search had become more intense as academic units were merged to form the teams of Love, Peace, Hope and Joy. Amidst the overwhelming support and thunderous cheers for the candidates, SPUP crowned its new ASEAN Ambassadors on December 19, 2017. Prior to the coronation night (on December 15, 2017), the aspirants exhibited their talent, walked confidently in their plain colored shirt and eloquently explained their advocacy. 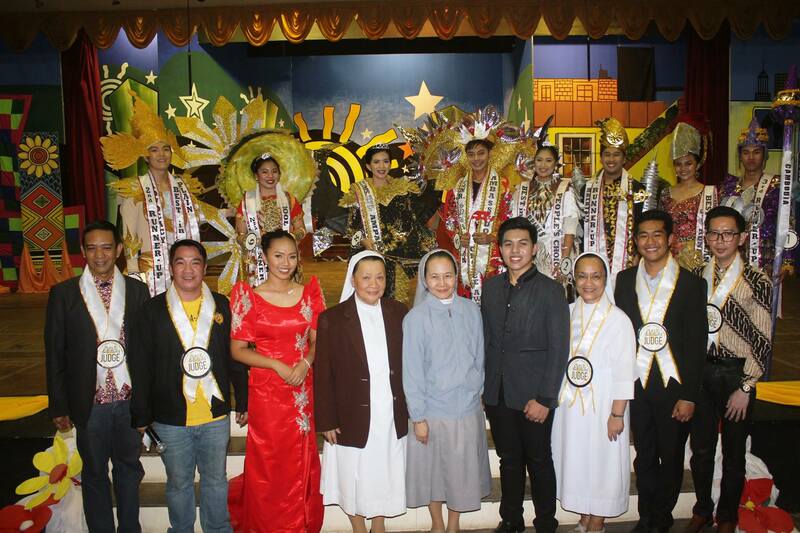 In the coronation night, the candidates demonstrated modesty in wearing their Paulinian Uniform and displayed their wit by interpreting words relative to ASEAN integration. They also showcased ingenuity as they modeled creative attire of the ASEAN country they represented. Combining the judges’ score and the people’s vote, Mr. Xetray Quebral (Team Joy) and Ms. Shania Salas (Team Peace) were crowned 2017 Mr. and Ms. SPUP ASEAN Ambassadors. Completing their court were: First Runners Up – Mr. Zahn Gavino and Ms. Lady Apricio (both from Team Love); and Second Runners Up – Mr. Gunwoo Baek (Team Hope) and Ms. Anadee Tumacder (Team Joy); and Mr. Meihzen Andres (Team Peace) and Ms. Christianne Cerezo (Team Hope) respectively. 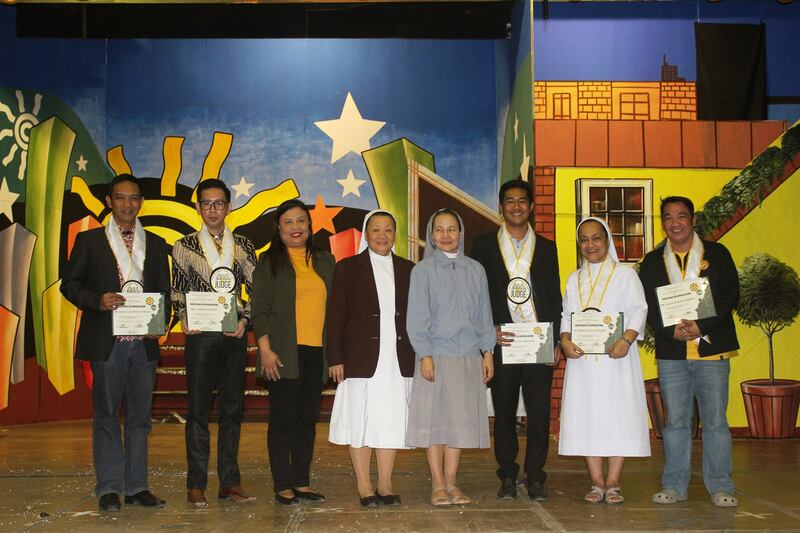 Sr. Merceditas Ang, SPC (University President) and Sr. Carmelita Villanueva, SPC (BEU Principal) awarded the special recognition to the candidates; while, 2016 Mr. ASEAN Ambassador, Mr. Justin Valencia and 2016 Ms. ASEAN Ambassador, Ms. Kim Garnett Andaya passed on the crown to their successors. The following special awards were given: Best in Plain Colored Shirt – Mr. Gunwoo Baek and Ms. Lady Apricio; Best in Talent - Mr. Gunwoo Baek and Ms. Shania Salas; Best in Uniform - Mr. Xetray Quebral and Ms. Anadee Tumacder; Best in Creative Attire - Mr. Zahn Gavino and Ms. Christianne Cerezo; Mr. and Ms. Congeniality - Mr. Zahn Gavino and Ms. Anadee Tumacder; Best in Advocacy - Mr. Gunwoo Baek and Ms. Shania Salas; and the People’s Choice Award - Mr. Xetray Quebral and Ms. Lady Apricio. Mr. Anthony Baliuag,CPA (Former PSG President); Sr. Maria Lirio Gavan, SPC (Vice President for Finance); Mr. Ahmad Shalani, MSN (Clinical Instructor, STIKES Sari Mulia, Banjarmasin, Indonesia); Dr. Allan Peejay Lappay (Director, Alumni, External Relations and Advocacies); and Dr. Jeremy Godofredo Morales (Director, International Relations) served as judges in the coronation night.